Printing errors are an interesting side effect of banknote production. Some error notes manage to escape into circulation. 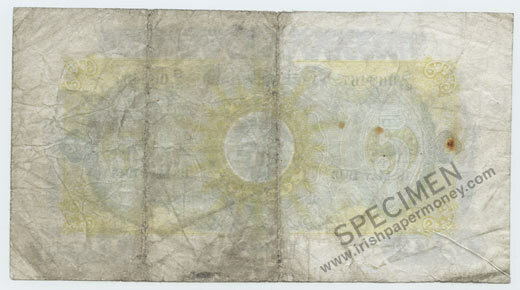 Irish error notes are relatively rare, especially older issues. 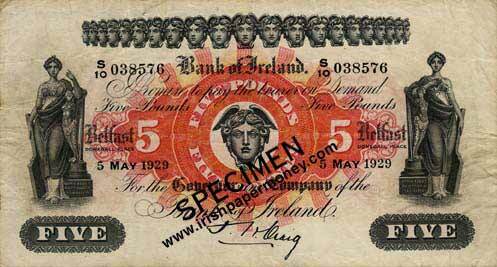 Collecting errors tends to be a niche end of note collecting and Irish error notes tend to be undervalued in terms of their relative rarity. Some error notes can be quite spectacular. 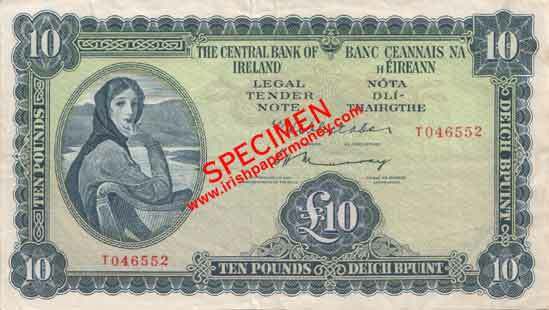 Here are a few Irish error notes. Bank of Ireland £5 1943 missing print error. The red printing layer is completely missing from both sides of this banknote. 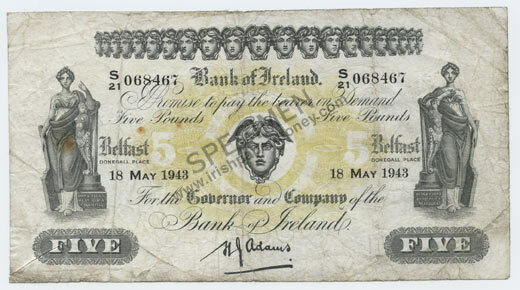 Bank of Ireland Five Pounds 1943 missing print error, with a normally printed note below for comparison. 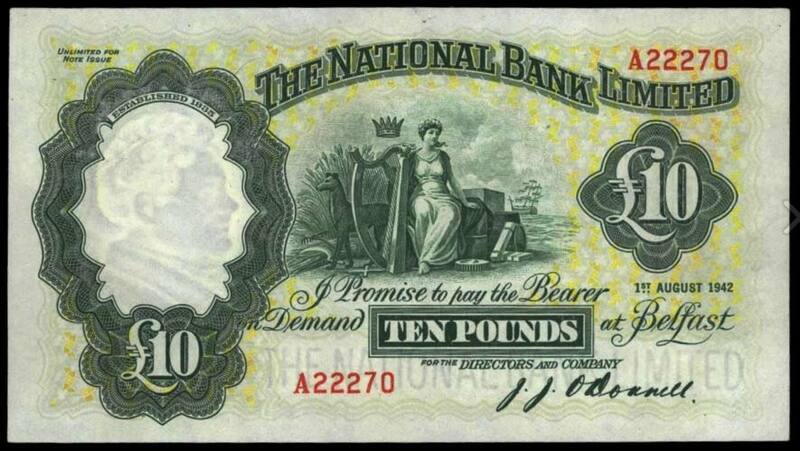 Here is a National Bank £10 note from 1942 which may be a similar type of error with the pink print layer completely missing. I attach a 'normal' note for comparison. Wow! There is quite a striking difference. The serial number on the possible error note is normal, suggesting that the note has not been tampered with. Looks like the yellow is too strong on the top note, and the pink is just totally faded. Could it be just a badly enhanced scan? 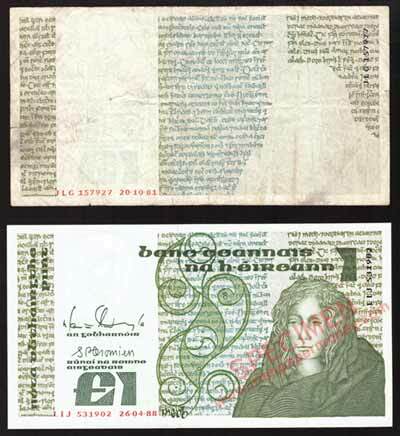 Here is one of the more spectacular B Series errors, a £1 note missing one of the layers of print. These missing print errors on the celtic series I like. i have a £1 similar to that, and a twenty with some printing missing from the back. Has a similar error been seen on £5 or £10? I have not yet seen this type of missing print error on £5, £10, or £50 denominations. There are a fair few £20 notes with partial reverse print missing, and £1 notes with partial face print missing recorded so far. Can you please post a picture of a 5 pound print error? I can't find a picture of one on the Internet. 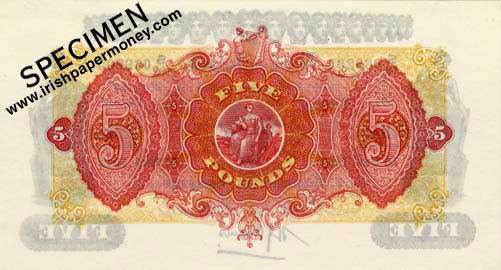 Here is a Series B £5 print error. One of my favourites is this 1975 £10 note missing date error on a replacement note!